"Beacon Farm" was built in about 1825, according to old maps, and eventually demolished in 1975 when the Newmarket By-Pass was constructed nearby. These maps also indicate that, at some point in time during the mid-1800s, what had been called "The Four Mile Race Course" was re-named "The Beacon Course" after this prominent land-mark. Because few photographs of the farm seem to exist (according to the Newmarket Local History Society), a painting of "Beacon Farm" may be considered of some historical interest to the Horseracing Community, some of whom have memories going back 35 years and will remember it personally. Other younger people may wonder what the building that stood beside Cesarewitch Starting Gate for 150 years looked like. 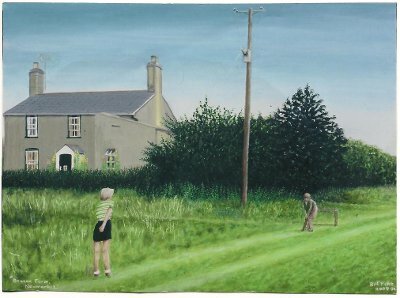 The artist lived there in boyhood (1955-63) and is depicted playing cricket outside when aged eleven with his cousin, Marilyn, aged ten, as the demon fast bowler! This painting is offered for sale at £500 (Five Hundred Pounds) with 50% (half) of the proceeds to be donated to the Injured Jockeys Fund (IJF) Charity.